The pelican likes to live in lonely places, such as a rocky island in the midst of the ocean, where nobody will come near to disturb it. 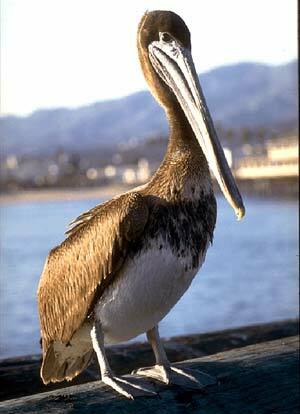 he pelican is a large bird, and a curious one. It sometimes measures nearly six feet from the top of the head to the end of the tail; and you know that this is the height of a tall man. It may be called a water- bird, because it lives on the sea-coast, or on the borders of lakes and rivers and lives upon fish only. It has a very long bill, and under this is a curious bag or pouch to hold the fish which it takes. When there is nothing in it, you would hardly notice it, because it is drawn up close under the bill; but it is so large that it will hold two or three gallons of water. When the pelican goes to seek for its food, it flies up into the air for some distance, then turns its head on one side, and with one eye looks sharply down into the water until it sees a fish. Then it darts down very swiftly, and is almost sure to seize it. Instead of eating the fish at once, it usually stores it away in its pouch, and watches for another. When its bag is filled, it flies away to some lonely place to satisfy its hunger, or to feed its young. In order to get out the fish, it presses its bill against its breast; and this has led some people to believe that it pierces its breast, and feeds its young ones with its own blood. Of course this is only a fable. The pelican likes to live in lonely places, such as a rocky island in the midst of the ocean, where nobody will come near to disturb it: it is for this reason that David says in the 102d Psalm, "I am like a pelican in the wilderness," or solitary place. I suppose he wrote this Psalm when he was very sorrowful; perhaps when Saul was pursuing him, and trying to take his life.